McLean Forge and Welding’s long and successful presence in the Boulder community makes this locally owned small business one of the oldest and most experienced Boulder custom welding shops. McLean Forge was originally founded by Barrie McLean who is known as the “Iron Man” of Boulder. In January 2017, Ray Tuomey and Paul Szlyk purchased the business from Barrie. 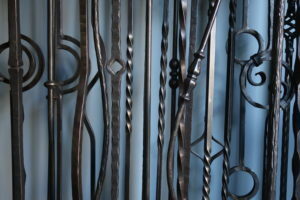 Our team of fabricators specialize in custom artistic metal work as well as steel fabrication and repairs, making customer service and attention to detail our top priority. Working with contractors, interior designers and architects as well as individuals, our goal is to take your ideas and make them reality. Ray Tuomey and Paul Szlyk are very active in the local community and are proud members of the Boulder Chamber. We prefer interfacing with the Cable Connection’s Ultra-Tec Cable Railing System because of its superior design features and overall superiority in quality and construction. They offer outstanding technical support and customer service to us to ensure the finished product has met the customer’s wishes. Artist-Blacksmith’s Association of North America is a non profit organization committed to keeping the art of blacksmithing alive and maintaining a meaningful connection with the past while supporting functional creativity.